Built-Up Roofs In Dallas, TX - We Provide Installations, Repairs And More! If your business has a low-slope roof and you want your roof to last a long time, our experts at Eclat Roofing recommend you look into built-up roofs. Built-up roofs are made of tar and gravel in conjunction with layers of bitumen and organic or glass-fiber mats to reinforce the roof. These types of roofs last for decades with proper care and maintenance. There are several types of built-up roofs that all have the layers of components in common. Cold asphalt is applied on some for an eco-friendly installation; hot is applied on others for a faster installation. Eclat Roofing is the top commercial roofer in Dallas, TX built-up roofs! Call now for your roofing service at (214) 373-1500! These types of roofs are incredibly durable. However, every once in awhile they may need a Dallas, TX built-up roof repair. We can repair your building’s roof fast! Whether you’re seeing leaks, pests, or something else, we can repair cracks and holes in your roof easily and effectively! We want your roof to last as long as possible, which is why we only send out knowledgeable professionals who can assess and fix damage to your commercial roof. Eclat Roofing is proud to bring the Dallas, TX area built-up roof maintenance. Built-up roofs are extremely durable against rain and storms that are so common in DFW. 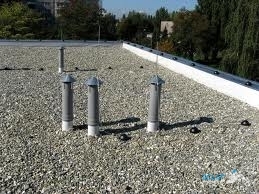 These roofs can last for upwards of 20 to 30 years with proper maintenance. That is why maintaining your roof is so important. You can always contact us for a quick roof check, whether it’s after a storm or not, to check on the integrity of your roof. Built-up roofs are unbelievably waterproof due to the number of layers of materials that protect them, so you can rest easy knowing your roof is strong enough to survive storms. They protect against UV rays, they’re low-maintenance and the repairs don’t cost much. We are the most trusted commercial roofers in the DFW area, Oklahoma and Louisiana. We have an A+ rating with the Better Business Bureau. Call the roofing experts at Eclat Roofing now at (214) 373-1500 to see if Dallas, TX built-up roofs are right for your commercial building! Updated on September 13, 2018 at 3:00 pm by Eclat Roofing.